Hey all – just sharing a bit of our winter. I don’t think I could describe the sound snow makes under boots on a cold winter day but hearing the noise, even without seeing the video – brings me back to very cold mornings waiting for the school bus in Massachusetts. Thanks for sharing your beautiful Winter! Look at those gorgeous trees. And the crunch-crunch of the snow under your feet. I love. Here it’s gray and rain rain rain. Does Coop play in the snow?! @diana Coop enjoys the snow for sure. He’s 11 now so her has slowed down, but he’ll still run and play on a cold day. Wow! That reminds of The Chronicles of Narnia. Anything bellow 50 degrees is too cold for me. I’m sure that air is very refreshing and alkalizing to the body. @silvawhite The air is refreshing for sure…but when that icy wind comes off the bay… BRRRR. Yes!! I love that movie! I am looking forward to another snow storm here in Aurora — soon I hope!! I just love the way it gets so very quiet as the snow falls, like being away from civilization. 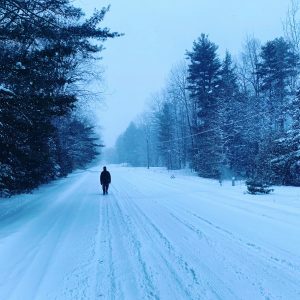 @abenford That’s my favorite thing – walking out in the snow when it feels so desolate. During holiday break, I would walk at night with my headlamp. It was amazing. I am in Aurora, NY! We have been having wildly variable weather and many “snow” days but some of them have been for extreme cold or ice. Watching this video reminds me of how much I have missed snow shoeing the past couple of years. We just got out of the habit of doing it but also many times if we have deep enough snow to do it the temperatures are below zero and I just say “no” to that degree of coldness. Then we have had a lot of rain in between snow storms so everything turns to ice or washes away. I am so into hibernation mode this year it isn’t funny. I meant “snow days” as in days off from school and days we need to close the library. Both of those issues are wreaking havoc with my schedule both as a Speech Therapist and in the library. I loved the video! I lived in Lake Tahoe for seven years and I loved the snow. There is nothing like the sound of snow crunching under your boots and the quiet, peaceful sounds of nature when taking a winter walk. Thank you so much for sharing! That is a beautiful video! I felt like I was taking the walk with you. I just love winter! Thanks for sharing. I was recently visiting a ski resort and the snow storm was so bad, so many cars stuck & it was just so white from the snow, could barely see where you were going. After it calmed down, it was so beautiful and the fresh air! Looked exactly like in your video! I had a great time even tho the ski chairs were closed. @karen @neckroth @mosminwoo Thanks for watching and for sharing your thoughts. I’m glad I put it together – was a little brain shift from reading blogs and such to creating the little movie in iMovie. @michael – Does everyone by you put in the disclaimer “weather permitting” when making plans in the winter like they do here? @lisasemenza Rather hearty folk up here but yes, that happens often. The schools just announced they will be adding a week in June to the calendar for all the snow days. The governor could still waive them though. @lisasemenza I had never experience the intense competition to be the snowiest city until I moved to Erie, PA for college. I had never experienced quite this much snow, either 🙂 Growing up in Colorado and South Dakota I thought I knew what winter was but I’m still amazed by the amount of snow we get in this area of the country. I love the ice dunes! I had never experienced them until I moved to the Lake Erie area. They are definitely something to see. I really like how you faded in and out of the different shots. Really cool! @hcanfield I used iMovie on my Mac. I digitized a bunch of home movies my parents add over break – like stuff from 1968, etc. I have been editing and fixing the videos up. It’s a fun exercise to shift gears like that.